NEW YORK — Global stocks are soaring Friday and reversing the big losses they suffered just a day earlier. The Dow Jones Industrial Average soared 700 points in the latest twist in a wild three months for markets. China’s Commerce Ministry said trade talks will be held Monday and Tuesday in Beijing, and investors will once again look for signs the world’s largest economic powers will make progress toward resolving their dispute. The tensions have dragged on for nearly a year, slowing business and dragging down stock indexes worldwide. Meanwhile the Labor Department said U.S. employers added 312,000 jobs last month, a far stronger result than experts had anticipated. U.S. stocks have tumbled over the last three months as investors worried that the economy might slow down dramatically because of a variety of challenges including the trade dispute and rising interest rates. The stock market’s plunge also threatened to shake up the confidence and the spending plans of businesses and consumers. Some analysts said investors were acting as if a recession was on the horizon, despite a lack of evidence that the U.S. economy is struggling. “It’s hard to square recession worries with the strongest job growth we’ve seen in years,” said Alec Young, managing director of global markets research for FTSE Russell. Until recently, the Fed had suggested it planned to raise short-term interest rates three times this year and next, and Powell said the Fed’s balance sheet was shrinking “on auto-pilot.” Wall Street feared that the Fed might be moving too fast in raising borrowing costs, said Phil Orlando, chief equity market strategist at Federated Investors. The S&P 500 index climbed 76 points, or 3.1 percent, to 2,524 at 3 p.m. Eastern time, more than wiping out Thursday’s loss. The Dow added 698 points, or 3.1 percent, to 23,385. Earlier it gained as much as 832. The Nasdaq composite jumped 255 points, or 4 percent, to 6,718. The U.S. and China have raised tariffs on billions of dollars of each other’s goods in a fight over issues including Beijing’s technology policy. Last month, President Donald Trump and Chinese leader Xi Jinping agreed to 90-day ceasefire as a step toward defusing tensions, but that failed to calm the stock market. Technology companies, banks, health care and industrial companies all made strong gains. Microsoft rose 4.6 percent to $101.90 and Deere gained 5 percent to $151.23. Retailers and internet companies rose as well, with Amazon up 5.1 percent at $1,576 and Google’s parent company, Alphabet, rising 4.8 percent to $1,074. Most of the companies in those industries stand to do better in times of faster economic growth. Smaller and more U.S.-focused companies did even better than larger multinationals. 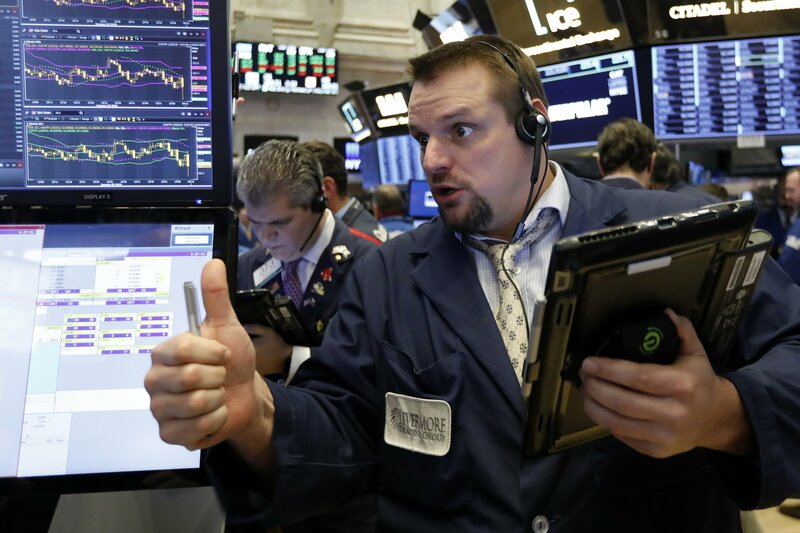 The Russell 2000 index surged 47 points, or 3.6 percent, to 1,378. Smaller companies have fallen further than larger ones in the last few months as investors got nervous about how the U.S. economy will perform in 2019 and 2020. After the market’s big drop in early December, stocks have whipsawed between huge gains and losses. Katie Nixon, the chief investment officer for Northern Trust Wealth Management, said investors will continue to react to the health of the economy, and to concerns about high levels of corporate debt as interest rates rise. European shares also overcome losses from a day earlier, with Germany’s DAX gaining 3.4 percent and France’s CAC 40 rising 2.7 percent. Britain’s FTSE 100 advanced 2.2 percent. In Asia, Hong Kong’s Hang Seng jumped 2.2 percent. South Korea’s Kospi added 0.8 percent. Japan’s Nikkei 225 index fell 2.3 percent on its first day of trading in 2019 as technology and electronics makers slumped on Apple’s report that Chinese iPhone sales were slipping. The dollar strengthened. It rose to 108.49 yen from 107.77 yen. The euro rose to $1.399 from $1.1391. The British pound moved up to $1.2737 from $1.2630.